Longchenpa, also known as Longchen Rabjam, Trime Ozer and other names, was born in the Tra Valley of South Central Tibet. From an early age he showed signs of great compassion and scholarly intelligence. He learned to read and write at the age of five and by the age of twelve took on the monastic vows at Samye. He became a student of Rigdzin Kumaradza who conferred upon him all the teachings of Nyingthig and declared him a lineage holder. Even though he was one of the most famous scholars of his day, he lived a simple life of mediation, study and writing. All material offerings he received he in turn gave away for the benefit of the Dharma. Throughout his life, Longchen Rabjam received all of the teaching and transmissions of all of the lineages in Tibet at that time. 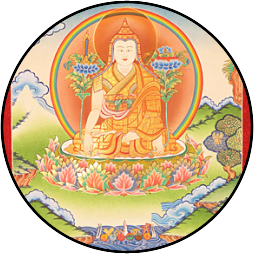 He held all of the transmissions of Dzogpa Chenpo and both lineages of Nyingthig, the Vima Nyingthig and Khandro Nyingthig. He wrote no less than 250 treatises on Buddhist history, Vinaya, sutra, tantra and especially the Nyingthig teachings of Dzogpa Chenpo.